Starting this year, employees will start wearing ‘smart glasses’ to work. Are you ready? The trickle of smart glasses entering enterprises on the faces of employees this year will become a flood in the years ahead. As the use of smart glasses becomes more ubiquitous in the workplace, the challenges for IT departments and, indeed, for enterprises generally will grow. And while the future of smart glasses is just now coming into focus, the unexpected consequences of this trend remain unclear. What I believe is certain is that smart glasses are coming, they’re going mainstream, and very few organizations are ready for what’s coming. Let’s take a look. In order to go mainstream, smart glasses have to look like ordinary eyewear. Apple is working on smart glasses designed to go mainstream. Apple has many patents around smart glasses, but the most recently filed patent application addresses this issue. The idea is to create a lens within a lens — one lens for seeing the real world and the other for seeing the virtual world. The approach, called a catadioptric optical system, would enable Apple glasses to project very large virtual content from a very small projector. The patent specifies the use of both outward-facing and inward-facing cameras in the glasses, which could be used for both gaze tracking and the mapping of the real world for the placement and anchoring of virtual objects. Apple products always invite speculation by designers. Just this week, designer Taeyeon Kim posted some impressive (if overly fashionable) Apple Glasses concepts. Meanwhile, Samsung recently filed both a patent and a trademark that suggest a Samsung smart glasses product. The company’s new patent in Korea describes “computerized vision-assisting eyewear,” which could be the long-rumored Samsung “Galaxy Glass” product. That’s how a trademark lawyer might describe smart glasses. Intel is working on smart glasses it’s calling Vaunt glasses. They look close enough to regular glasses, but they do a few “smart things” that ordinary glasses don’t do. Intel’s glasses don’t have cameras, speakers or microphones, although future shipping versions reportedly may contain microphones. They’re non-intrusive, visual and silent. The wearer sees icons and red text, but only when looking down. Otherwise, the visuals are not visible. Vaunt glasses should be able to provide walking directions, smartphone notifications and other "lite" forms of information. They should get 18 hours of battery life, according to Intel. The glasses can work with prescription or nonprescription glasses. They come in a variety of styles. Intel plans to launch a beta program for the glasses this year. VSP Global this week launched what it’s calling Level smart glasses. Think of Level glasses as fitness trackers. Instead of a watch or fitness band, however, they're glasses. Kind of like "Face FitBits." The glasses contain a magnetometer, an accelerometer and a gyroscope, and they track movement, from which the included smartphone app can figure out distance, steps, calories burned and other quantified self data. They also contain a “Find My Glasses” feature. I believe the most interesting aspect of VSP Level glasses is that they’ll be sold in the normal channel that serves optometry offices, starting in April in limited cities, including Sacramento, Seattle, Portland, Denver, Minneapolis and Washington, D.C. This is the future of smart glasses. “Smarts” will be a checkbox item whenever you get prescription glasses. What are smart glasses, anyway? Pundits throw around terms that sometimes confuse more than illuminate. This category of device will for the foreseeable future be expensive, bulky and obtrusive. They will not be products for walking around, but instead will be used in controlled settings. They will specialize in high-definition, 3D virtual animated objects that appear to float in space. Smart glasses are different, and when they go mainstream they will look almost like ordinary glasses or sunglasses, but will contain batteries and processors. Smart glasses are for everyday, all-day wear. And their purposes are far less specific in their application. For example, smart glasses may only provide audio, or even blinking-light notifications. Or they could offer heads-up or low-res augmented reality. They might even simply gather data, or offer battery-powered, on-the-fly conversion to sunglasses. In other words, smart glasses won't be a single thing. They could be tailored to individuals’ needs and do anything. And there will be a category of smart glasses for everyone. Many users will wear minimalist glasses with microphones and bone conduction speakers for interacting with their virtual assistants. Others will want glasses that function tomorrow like smartwatches do today: offering notifications and limited control over music, podcasts and phone calls. Still others will do all that plus automatically or manually take pictures and videos, or perform rudimentary AR. Even blind people will wear smart glasses. A Japanese researcher is crowdfunding “Oton Glass“ glasses for blind, visually impaired, dyslexic and others that translate text into voice. In fact, it’s this extreme variety of function, combined with the necessity of eyewear, that will provide the greatest challenge. We're facing the prospect of many or most employees carrying semi-concealed sensor bundles (sensors that include cameras and microphones) that connect either via Bluetooth, Wi-Fi or cellular networks and that track location. 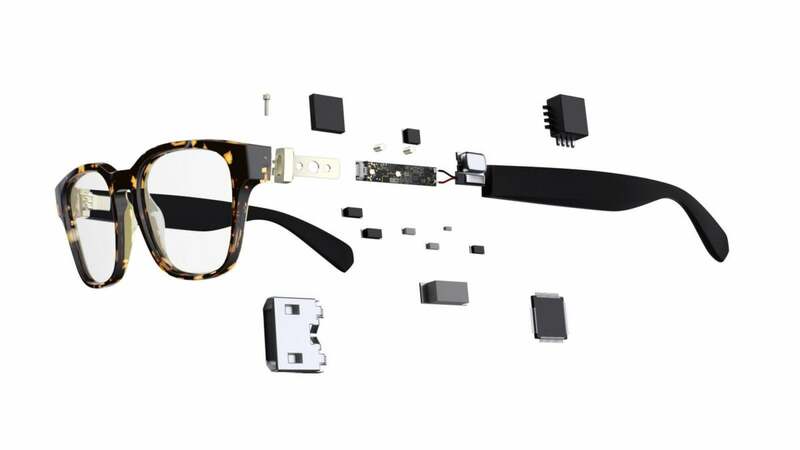 It will be difficult or impossible to know which sensors and components are built into which glasses. And in any event, the banishment of these sensor bundles will be extremely difficult, since they're also required for vision and therefore the basic performance of employees' jobs. You can ask meeting attendees or R&D visitors to leave their phones in a box outside, but you can't do that with glasses. In addition to threats to trade secrets and heightened exposure to hacking, there will be new issues with illicit recordings and captured data between and among employees and by partners, customers and others. Nobody has the answers to these challenges. But companies that want to stay ahead of the game need to start figuring out solutions sooner rather than later.